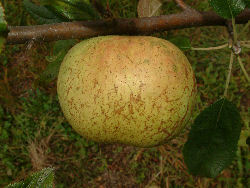 This is an old, local heirloom originating in the mountains of north Georgia and still sold by Lawson’s Nursery of Ball Ground, Georgia. It is most noted for its late bloom, offering protection from late spring frosts. Fruit is medium with clear yellow skin. Ripens late fall to early winter.